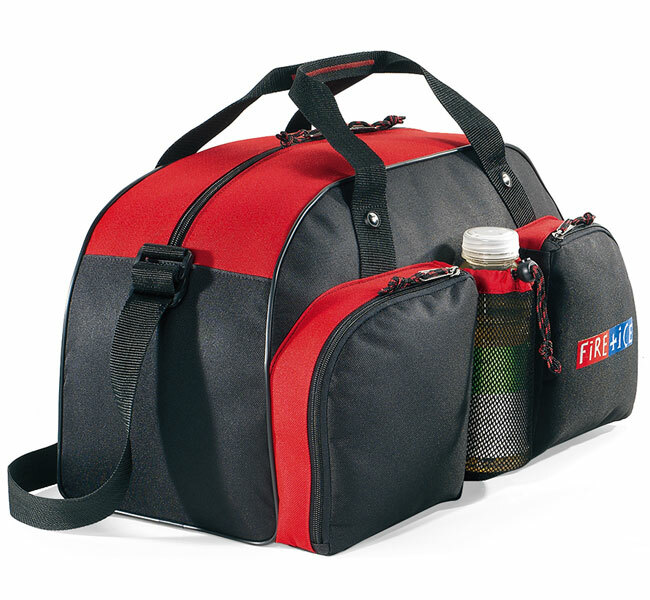 Unique promotional sports bag is serious logo promotion with multiple high exposure custom imprint or logo opportunities. Applications include high functioning girls cheer team bag, high school boys sports team bag and promotional items. located between the front pockets, double wrap carry handles and an adjustable shoulder strap. Overall size of the sports bag is 18" wide x 10 1/2" high x 9" deep. Rush Sports Bags Production is available. Price includes a one color imprint on one of the two pockets in area 4" wide x 4" high. or 2nd location imprint add a screen and running charge of $.99 each. Water Bottle II Sports Bag has a max of a three color imprint. Embroidery on one front pocket center is available in an area 3" diameter. Factory tape charge for embroidery up to 7000 stitches is $150.00. increments thereof add $25.00 tape and $.30 each unit.